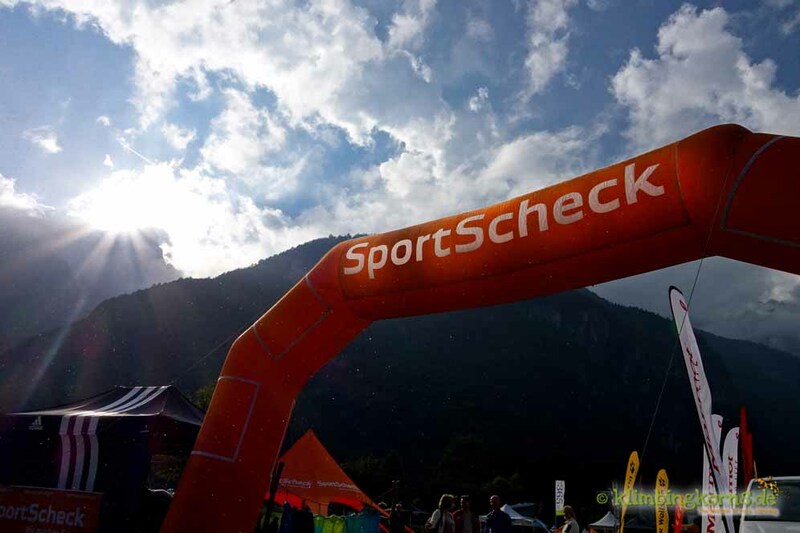 The SportScheck OutdoorTestival 2014 is THE Event to try out different Outdoor sports over a long weekend in Lago di Molveno, 40km north of Arco, in Italy. About 280 people where there to test new gear, try out new sports or sweat out in their element. 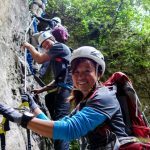 MTB, Rock climbing, Via-Ferrata, SUP, and River trekking are just some of the activities that you can join in. 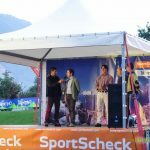 With the Brenta Dolomites looking just over the little town of Molveno, no other location would’ve been better to place this event. So, new summits, new challenges and new gears to take a look at this long weekend. I was psyched! 5 See you again Molveno! The quant little town of Molveno, perched above the beautiful Molveno Lake welcomed me with a small ray of sunshine, as I arrived in the early afternoon. 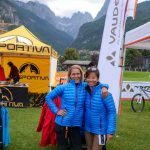 After checking in and receiving a handful of goodies to the OutdoorTestival 2014, I made my way to the hotel to throw my things in before heading out again, together with Angelica, one of the first Bloggers that arrived. We took a stroll through little tunnels that sometimes resembled a labyrinth down towards the grounds of the OutdoorTestival 2014. The event grounds were filled with plenty of stands from important Outdoor manufacturers. 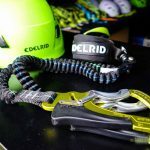 I quickly found gear (in my size!) for the next days and ended the day after the Pasta Party, hellos to other fellow Bloggers and a night-cap at the lively village bar. 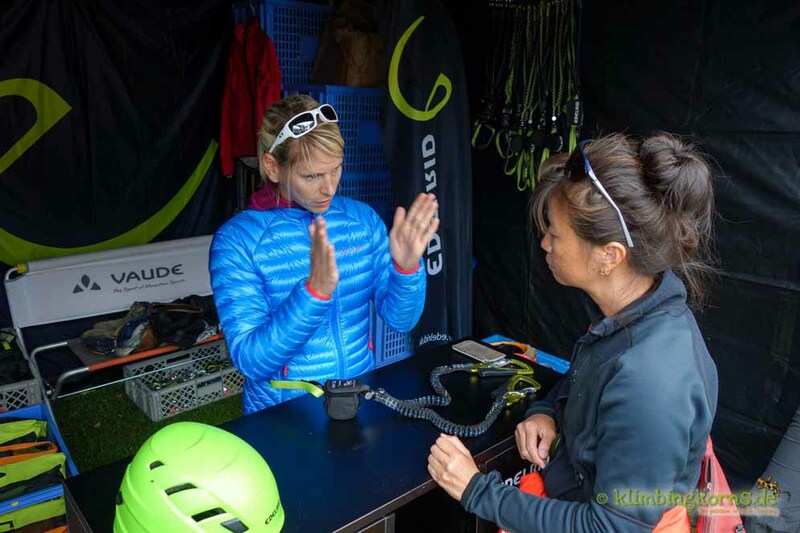 Oh what a surprise to learn that not only did Vaude bring along functional, colourful products, but a lively DJ too! 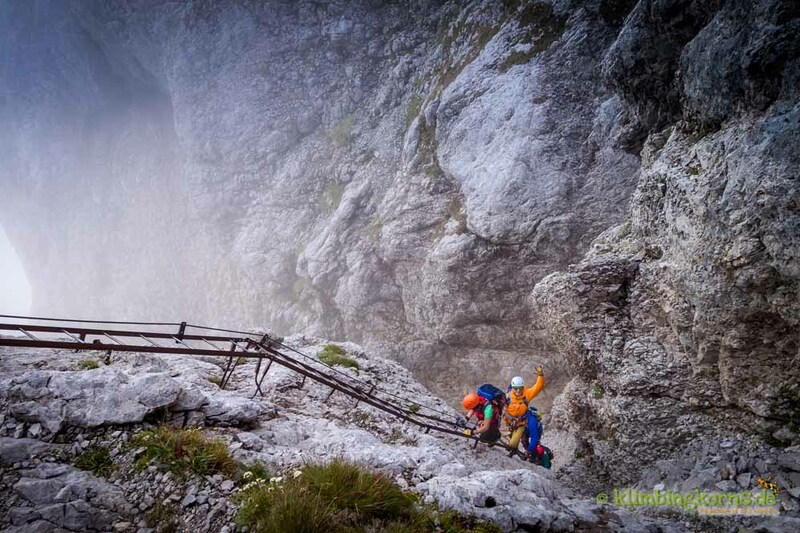 My choice fell on a Via-Ferrata which was something that I have not done often. I took many careful hours to pick the perfect tour. It had been important for me to have ample time to learn the essential technic on the first day. And should it all fail, … the wine degustation would come to my rescue, right? 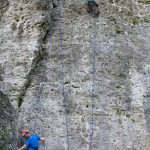 After a short drive to the foot of Castel Drena our guides explained everything we needed to know before getting on the Via-Ferrata Rio Sallagoni. There were plenty of Do’s and Don’ts and what to do when this and that. 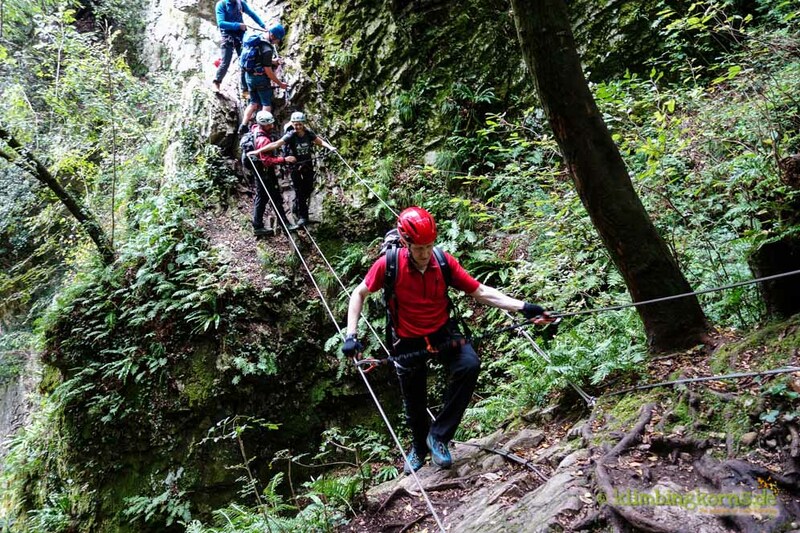 With helmets and harnesses and Via-Ferrata sets, we left the parking lot to the entrance of the gorge. Some 5 minutes later, the canyon appeared. It twinkled and shone marvelously with the sun rays that fell into the sparkling water, spraying droplets everywhere. Little waterfalls and rock pools gushed continuously which made me suddenly wish I had emptied my bladder before coming in here. Click, clack, click, clack, it started sooner than I had expected as we started proceeding in to the canyon. The group was divided into 2 with the beginners in front and the more advanced behind. The canyon reminded me somewhat of a more natural, romantic “high rope garden” The whole “parcour” was secured with a wired rope and iron rungs to step on. 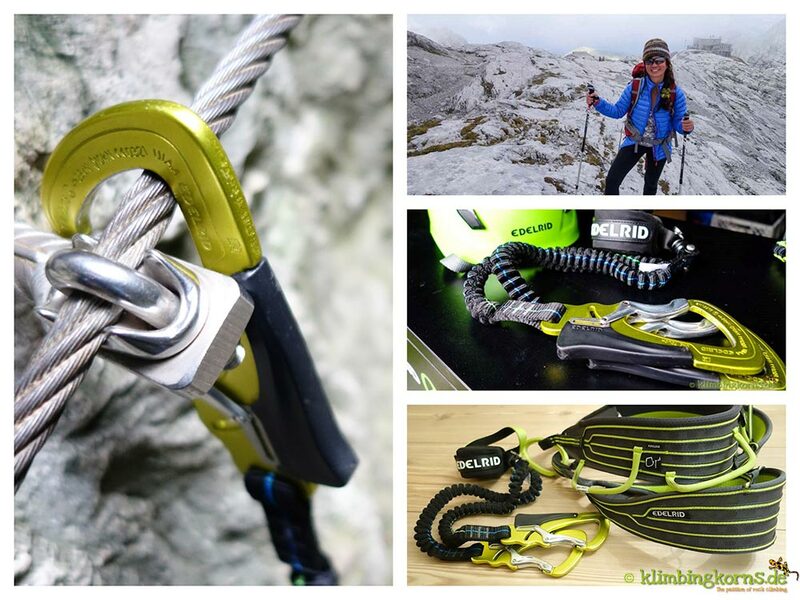 And we were always reminded to have always one of the carabiners clicked in, in all situations. 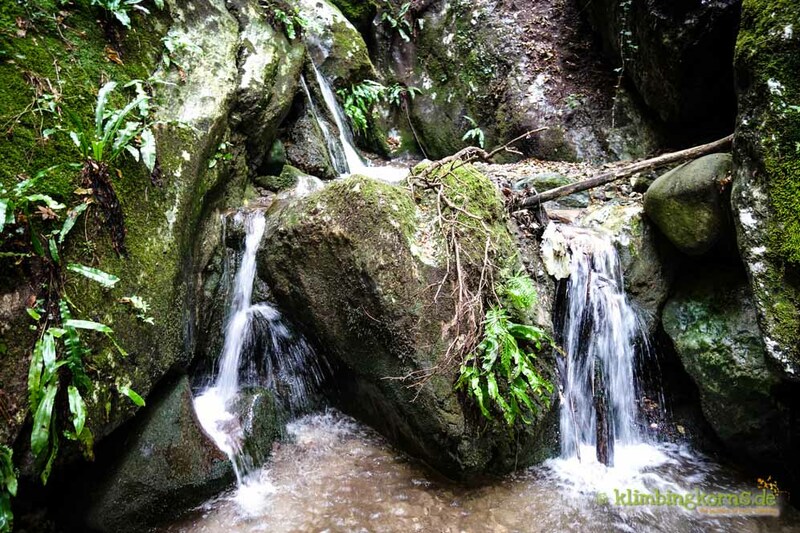 As we proceeded, the rocks became somewhat wet and extremely difficult to place your foot in the footholds on the polished, wet rock without slipping out. The overhanging section was the crux to the complete tour. 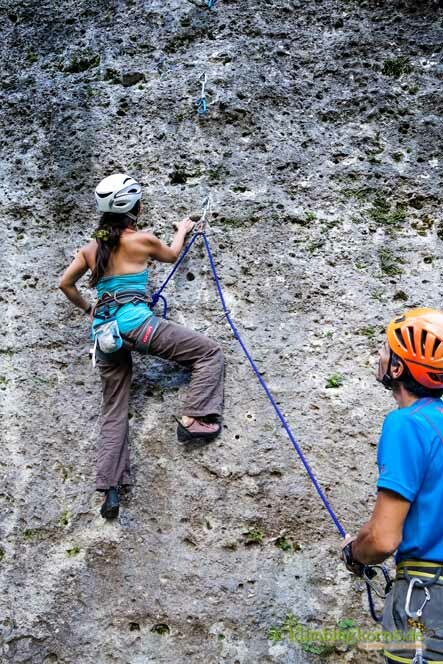 If there was a “jam” and you happen to be in the overhang, you could quickly feel how your forearms pump up should you not have a shorter sling to make a “stand”. We passed oasis of tropical ferns, small passage ways, romantic views of little waterfalls, steep caves and tufa walls, (not bolted!) and the last 2 sections came with a wired rope bridge to balance over. We reached the end of the canyon and hiked up to the bar where suddenly temperatures shot up to what felt like 10° more than before. After a short rest, we made our way back to the bus and came to the more comfortable part of the tour of the day. 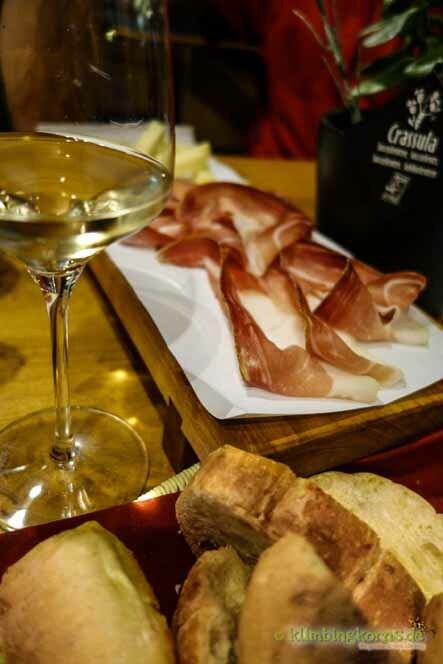 Wine degustation at the Cantina di Toblino! Fotos: check out my Facebook page for more fotos or simply write me a Mail or comment. Until the guy from the Scotts stand, handed me my MTB. I felt it was going to be serious. 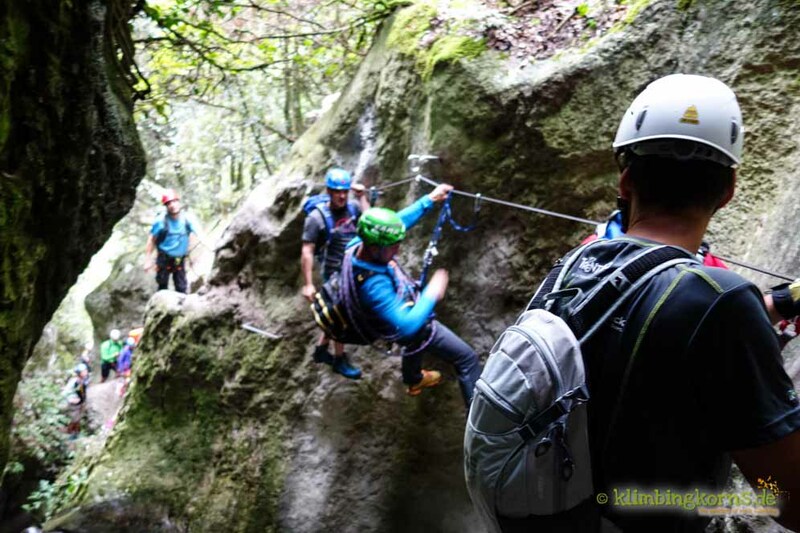 Our Guides Fabrizio Conforto and Cristiano Virgillio, explained to us that we will need about an hour – 10km – to get to our climbing spot with the bikes. A few minutes later, we started off on the trial at the side of Lago di Molveno. What started off in an uneven rocky road , turned into a long steep slope. The clicking of the gears can be heard. I started to switch mine too. Click, click, click, click, click. Damn! Pulled all the wrong gears! My tempo was falling, and so was I! It was then I start to push my steel donkey up the hill. Damn again! I was wearing all the wrong clothes. Much too warm! But there was no time to change. And so this scenario followed me until we reached the crag Promeghin. I couldn’t imagine I was still going to have a climbing session after this. And it was all my fault! Nobody knew it was my first time on a MTB trial! Promeghin is a small little crag in San Lorenzo in Banale. 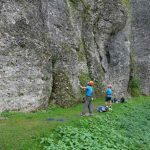 I have been here once many years back, but because it was completely infested with nettle plants back then, we were unable to climb here. Back again after all these years, I was surprised to find picnic tables and benches, rubbish bins and cleared paths infront of the wall. How comfortable! The bolting here was extremely friendly and made it an ideal spot for those climbing in the 6th French level. We were again divided in two groups with Cristiano as our guide. I belayed him as he prepared the routes for a top rope. 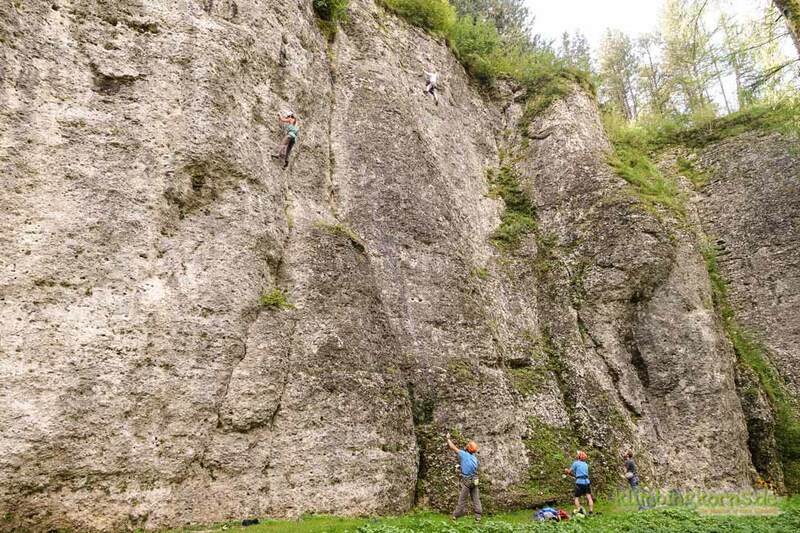 As he started to lead the second route, I asked him to leave the quickdraws on the wall, as I wanted to lead too. I started to feel back into my element as I climbed the route. I could hear Cristiano firing me up the wall as I clipped the anchor, a complete gush of adrenalin must’ve rushed to my brains. All exhaustion forgotten, happy and contented a 6b flash in the pocket. We climbed a few more routes the next hours before our return. Horror! Almost the same way back with the MTB where we came! (Incase you are wondering, climbers are rumoured for loving short and comfortable accesses, and I have been a climber too long! ;) The round back to Molveno from the other side of the lake was much more panoramic and easier. Oh yes! I’ll have to work on my MTB performance real soon! 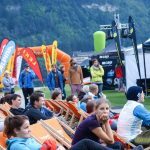 Level MTB: easy, but endurance is definately an advantage! Careful of wet slippery stones / roots. Fotos: More Fotos made on this day can be found on my Facebook page or write me a Mail or comment. Reaching back to the OutdoorTestival grounds, I returned all my test equipments and met up with a few of the other Bloggers who were still hanging around waiting for their transportation. Last few talks, hugs and good byes made it suddenly clear that it was the end of a great event. I stayed another night in Molveno before moving on to the Dolomites to catch the Supermoon. 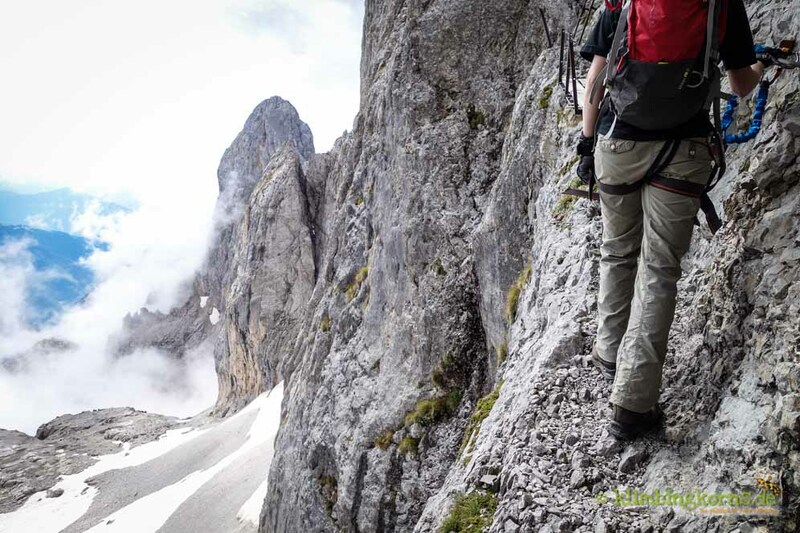 Catch us bloggers at Twitter #odt14 for a live ticker during the OutdoorTestival 2014. That way, you might also understand why Bloggers are also the ones with their Smartphones glued to the hands at all situations (wet and dry). Being actually more of a loner in my sport activities, I had been sceptical in the beginning about joining sports events in big groups. My scepsis was all gone after the second day. 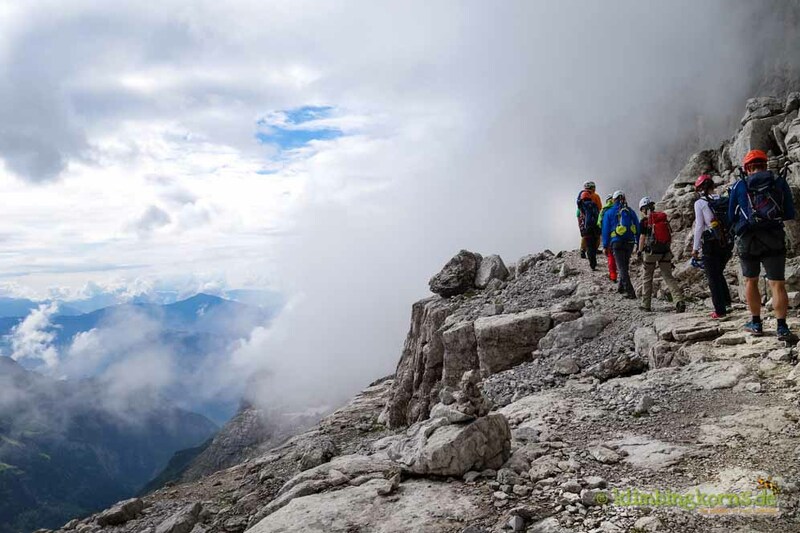 The OutdoorTestival 2014 proved suitable for outdoor athletes (in all walks of level) who has yet discovered the beauties of the Brenta Dolomites and are for those eager to try out other kinds of sports activities together with a mountain guide. 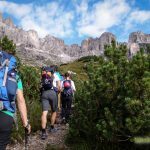 Molveno is the perfect location with plenty of hotels, Guesthouses and Camp grounds to suit all your needs, as well as mountains ala Dolomite style at your disposal. It has the deepest lake in the region (120m), there’s still about 52 brown bears living today in the Brenta National Park! 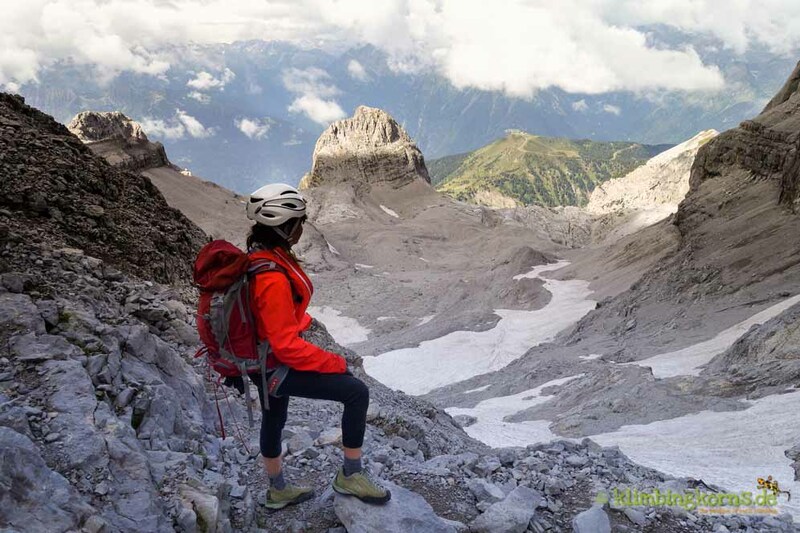 A paradise for all outdoor sport enthuasiasts. 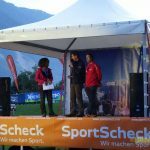 Thanks to SportScheck for making this possible. Thanks to Petrus for giving us dry weather during the day. Thanks to VisitTrentino for the hospitality and support! Thanks to all Outdoor-Bloggers for your support, tweets and faves and the good time! It was good to meet familiar faces again and get to know new ones ! See you again someday, hopefully latest at the next year’s OutdoorTestival 2015 ! Hey chris, it was nice to meet you again!